Grinch Cookies happen to be the best snack for watching The Grinch or pretty much any holiday movie. The bright green color is just for kicks to make them Grinch-like. They have a sugar cookie type of flavor, are festive and simple to make starting with a box of cake mix. The chefs in the kitchen today were my 4 ½ year old grandson and 2 ½ year old granddaughter. 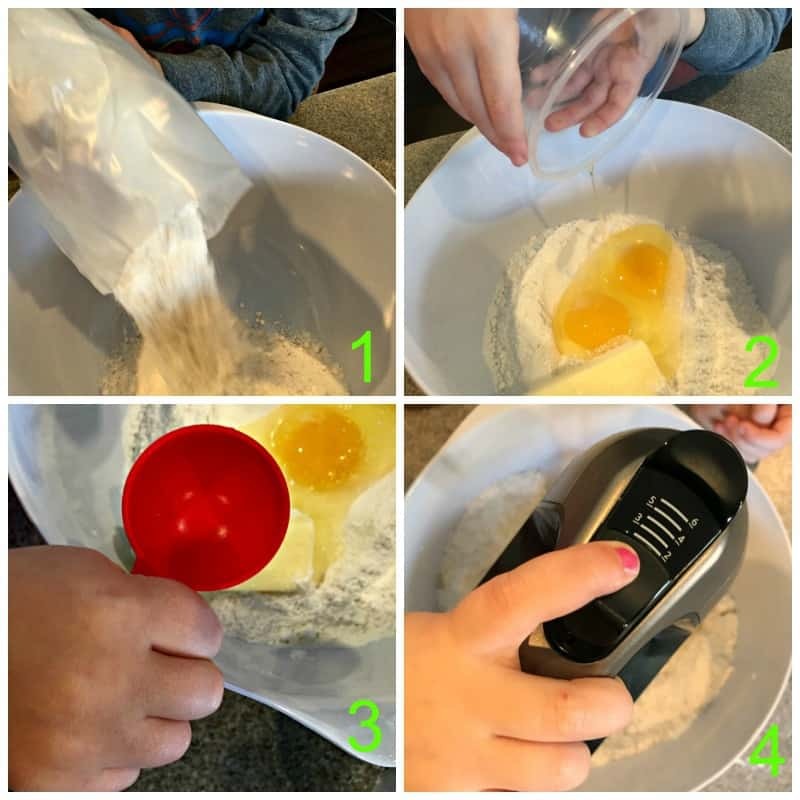 They had so much fun measuring and dumping and of course, using the electric mixer. Tip: remind little ones early and often not to lift the mixer out of the bowl when it’s turned on. They couldn’t wait to taste them so of course, the cookies became a pre-lunch appetizer we gobbled up. 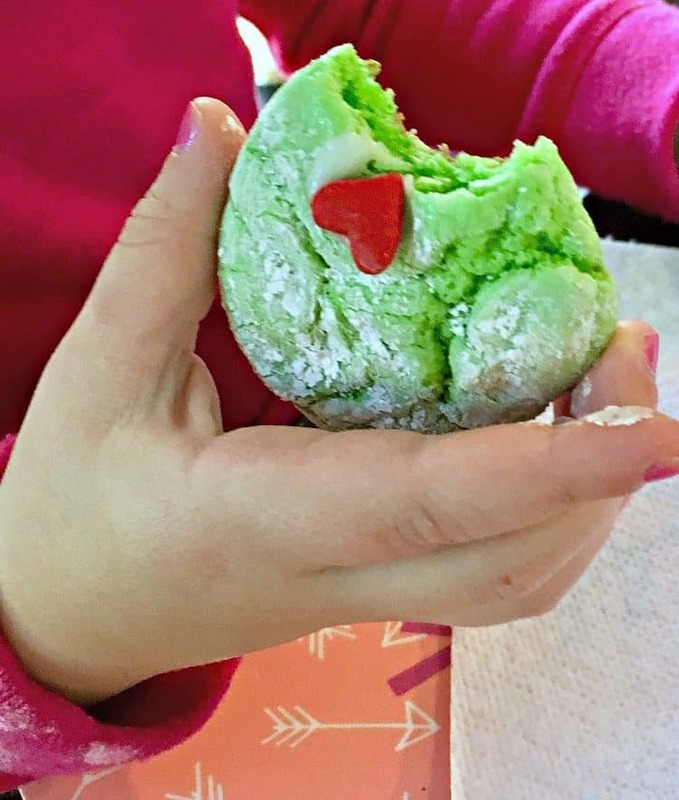 The inspiration for this recipe came from I Heart Naptime with a few changes and instructions of my own. Can I use liquid food coloring instead of gel? Yes, but the gel gives a more intense color. In a mixing bowl add the dry cake mix, butter, eggs and oil then mix until combined. Add green food color gel until it reaches your preferred shade of green. In a separate bowl, combine the powdered sugar and cornstarch. Roll the dough into about 1” balls (if your dough it too sticky, refrigerate it for 5-10 minutes) then coat the balls with the powdered sugar mixture. Place the cookie balls on a parchment paper lined baking sheet. Bake 8-10 minutes or until the cookies are lightly brown on the bottom. Remove the baking sheet from the oven and leave the cookies on the sheet for 2 minutes then transfer to a wire rack. In a small bowl blend the “glue” ingredients then add it to a sandwich baggie. Clip a small corner of the baggie then pipe a tiny amount of glue onto the top of the cookie. Add the heart and allow to set for a couple of minutes until it’s dry. 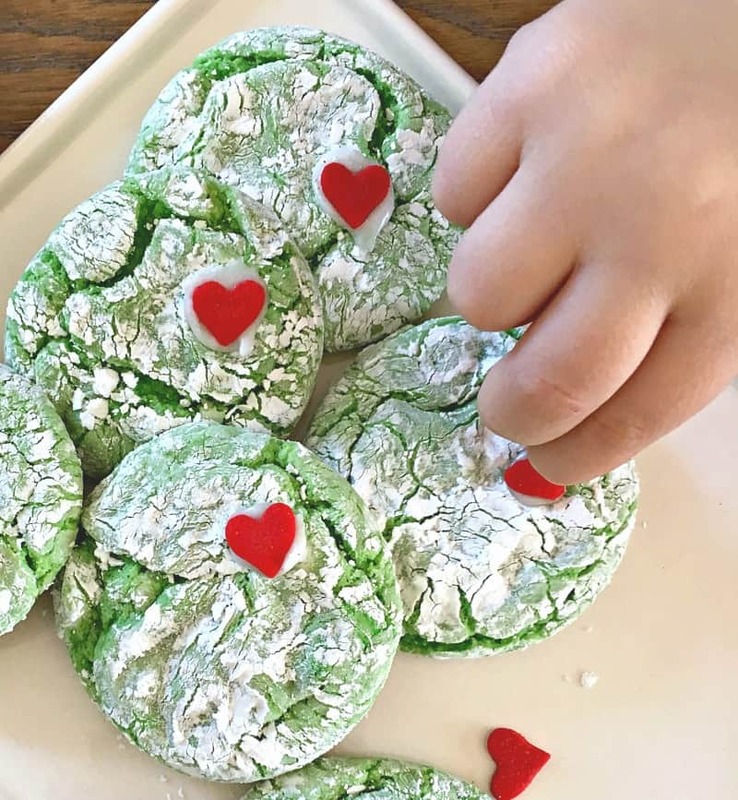 Click for another one of my family’s favorite holiday cookie recipes. 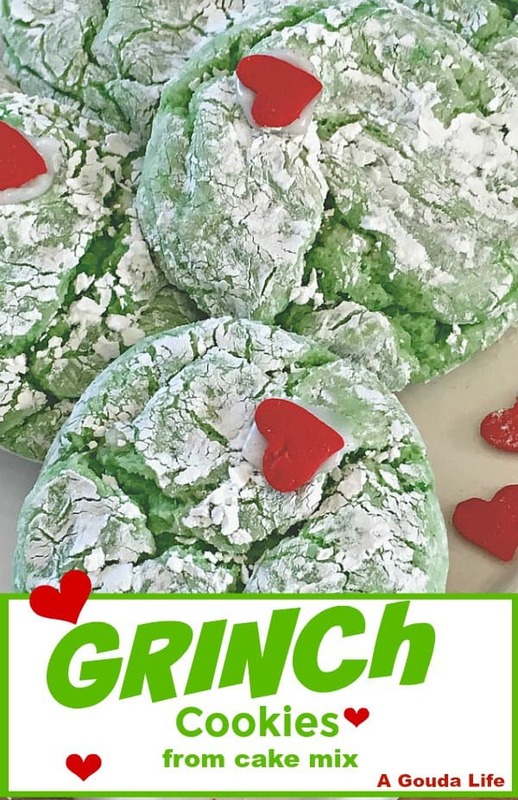 If you tried this Grinch Cookie recipe or any other on the blog, don’t forget to leave a comment or star rating ~ I love hearing from you! 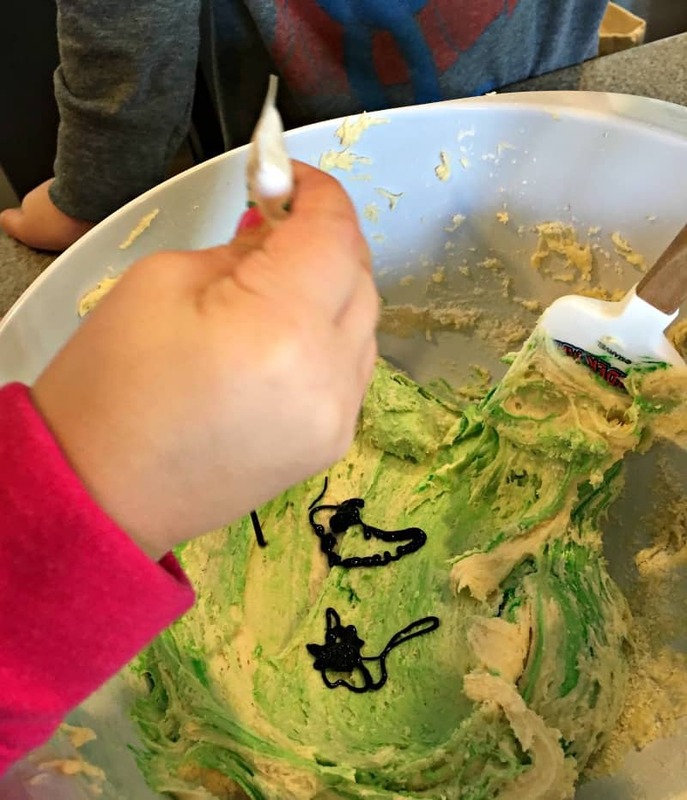 Grinch Cookies start with a box cake mix + a few other everyday ingredients including green food coloring. A fun, tasty treat for kids of all ages. In a mixing bowl add the dry cake mix, butter, eggs and oil and mix until combined. Add green food color gel until you see your preferred shade of green. 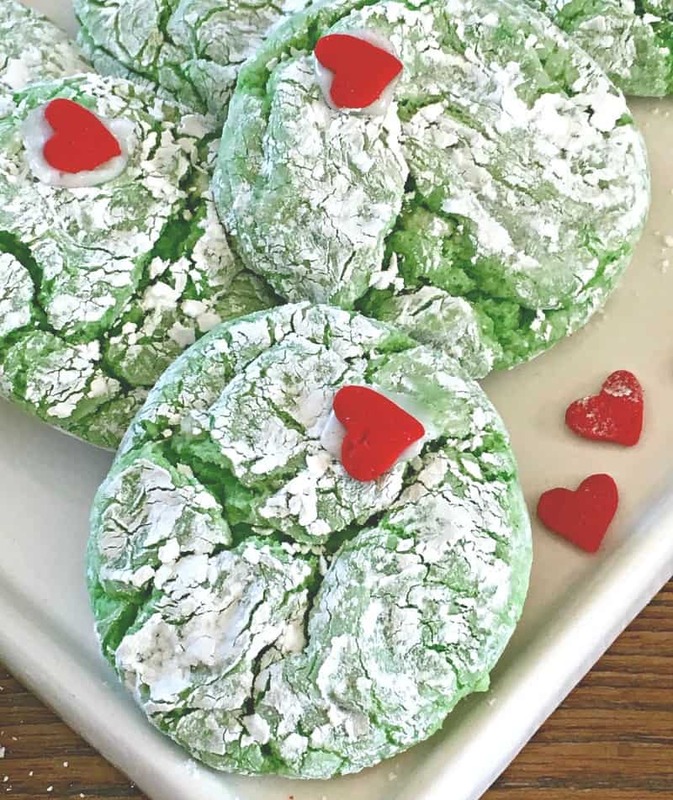 Tip: the cookies are slightly lighter in color after they’re baked. Refrigerate the dough for 10 minutes (chilling the dough makes it easier to handle). Roll the dough into about 1” balls then coat with the powdered sugar mixture. Place on a parchment paper lined baking sheet. Remove from the oven and leave the cookies on the baking sheet for 2 minutes then transfer to a wire rack. In a small bowl blend the “glue” ingredients then add to a sandwich baggie. Clip a small corner of the baggie then pipe a tiny amount of glue onto the top of the cookie. Add a red heart and allow to set for a couple of minutes until it’s dry. 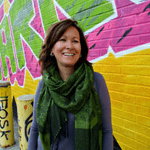 Hi Nancy – thanks so much! 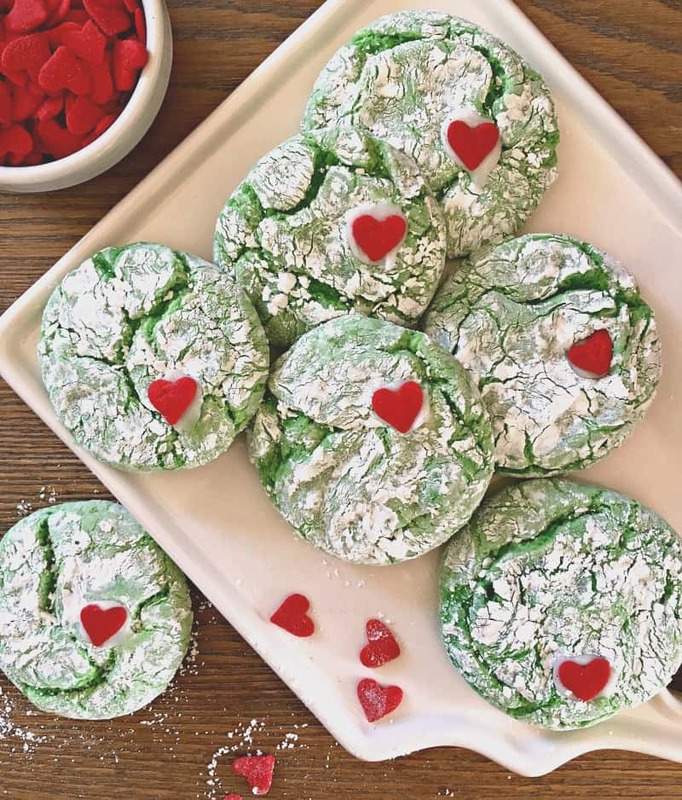 The cornstarch blended with the powdered sugar gives the cookies that ‘crinkle’ look but you won’t taste the cornstarch at all. Good question ~ I hope you enjoy them. They’re really fun for kids to make too.